– Purcahse a microwave oven that is listed by a qaulified testing laboratory. Make sure to complete and return the product registration card. This way the manufacturer can reach you if there is a recall on the product. – Plug the microwave oven directly into the walloutlet — never use an extension cord. – Make sure the microwave oven is at a safe height, within easy reach of all users. – Open food slowly, away from the face. Hot steam or the food itself can cause burns. – Food heats unevenly in microwave ovens. Stir and test before eating or giving to children. – Never heat a baby bottle in the microwave. Since a microwave oven heats unevenly, it can create hot pockets, leading to burns. Warm a bottle in a bowl of warm — not hot or boiling — water, or by running it under the tap. Always supervise children when they are using a microwave oven. 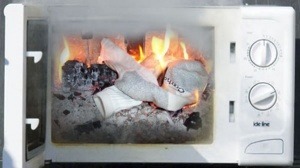 If you have a fire in the microwave, leave the door closed, turn the oven off and unplug it from the wall. If the fire does not go out, get outside and call the fire department.